As we age our bodies require fewer calories, but our nutritional needs remain constant. So the older we get, the more important it gets to load up our meals and snacks with healthy nutrients. Planning nutritious senior meals that your parents or care receivers will enjoy is much less of a challenge if you start with Tufts University’s MyPlate for Older Adults. The old USDA “food pyramid” is dead. In the summer of 2011 it was replaced by new USDA food guidelines and a new image called “MyPlate”. All adults have the same basic nutritional needs, but the way we get our nutrients changes as we age. After age 70 our dietary needs are affected by health issues such as high blood pressure, lowered activity levels, and reduced gut function. 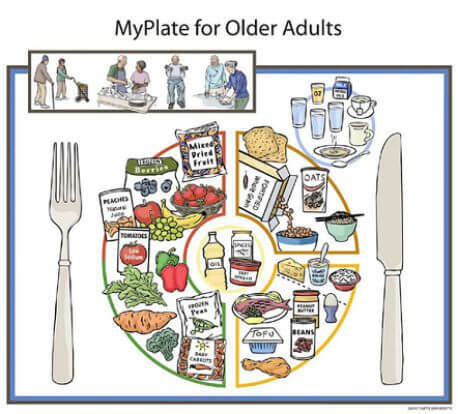 The scientists at Tufts University’s USDA Human Nutrition Research Center on Aging studied these changing needs and created MyPlate for Older Adults, a visual quick guide to healthy senior meals. MyPlate for Older Adults is divided into four parts. The plate itself has three sections, and where the original USDA My Plate shows a glass of milk, the senior version has a circle for beverages.